Coaching basketball—it’s a business where the stakes are high and the rewards even higher for those who find their way to the top.Sitting in his office inside Walter Sillers Coliseum is the CEO behind the Delta State men’s basketball program. He knows being a head coach is more than just managing a team—it’s running a business. He has left his mark on the basketball industry as the coach that schools turn toward when all hope seems lost, having transformed failing programs into winning programs time after time. He takes a look up at the television across from his desk. It’s paused on game footage from Delta State’s last home game victory, where the Statesmen won another “Grit and Grind” game. Winning has become synonymous with the Jim Boone name, the bookcase filled with awards in the far corner of the room is a testament to his success over the years, as well as the many photographs lining the walls. For Jim Boone, this is his 30th year as a head coach in the business—a feat that almost seemed impossible.”My parents did not want me to [be a coach],” Boone said. “They really wanted me to go to law school. By the end of my freshman year and in the beginning of my sophomore year [in college], I knew I wanted to be a basketball coach, and that’s where the love of the game first came.”A native of Winfield, W.V., Boone grew up in a family with a grandfather who worked in the steel mill, another grandfather who worked in coal that later owned a family business, and with a dad who served in the military and worked his way up the ladder to become a prominent business person in the state of West Virginia. Hard work, integrity, honesty, commitment—those were all values he learned from his family that would have a lasting impact on his coaching legacy. Boone started playing basketball in fourth grade where his love of the game continued to flourish over the years. He was a standout high school player at Winfield, which led him to a collegiate career. His parents finally agreed, but on the promise that Boone would attend graduate school, so he would have a fallback if coaching wouldn’t work out.”I ended up going to the University of Kentucky, and obviously basketball had a lot to do with that because of Kentucky’s strength as a basketball school in my choosing to go there, but I went there to get an MBA,” Boone said. He spent a year and a summer at Kentucky where he received his MBA with a concentration in marketing in 1982. In the afternoons, he watched Joe B. Hall conduct basketball practice, which was an incredible experience.”I learned a ton about coaching and basketball and a very high level of play at the SEC in those days,” Boone said. “Kentucky had an outstanding team, but also getting my master’s in business. I can’t tell you how much that has come into play and been very instrumental, I believe, in the success I have had as a basketball coach because in a lot of ways you’re running a small business. All the things I learned from managing a budget to managing people to organization and attention to detail to the marketing and selling of your program are all things I learned at Kentucky.”Taking what he learned at Kentucky, Boone began his coaching career as an assistant coach at his alma mater from 1982-85. He then made the jump to NCAA Div. I basketball in 1986, as an assistant at Charleston Southern University, where the Buccaneers won the Big South Conference Championship. His success at Charleston Southern led to his first job as a head coach at California University of Pennsylvania.Over the next 10 years, Boone led California (Pa.) to unprecedented success, including a 227-71 record and a .763 win percentage. During his time with the Vulcans, Boone’s squads claimed a 31 win season while also being the No. 1 ranked team in the country in 1992, two NCAA DII Final Four appearances, six regular season conference titles, and nine trips to the NCAA Tournament. For his efforts, he was inducted into the California (Pa.) Hall of Fame in 2005.”I’ll never forget those days,” Boone said, reflecting back on his time at California (Pa.). “It was amazing, and we took a team that was picked to finish last and won five games the previous year and we ended up winning the western division of our conference, played in the tournament final and won 17 games. It was kind of a storybook year for that to happen in your first year of coaching.”From California (Pa.), Boone took on the challenge of rebuilding NCAA Division I Robert Morris University. Boone had developed a “Grit and Grind” approach to basketball, making his brand of basketball one marketed on outworking opponents. At RMU, Boone led the Colonials to the NEC Championship game in 2000. In 1999 and 2000, he led RMU to a record of 25-13 in the NEC and produced two of the best seasons in Colonials history. His success in turning around downtrodden programs took him to Eastern Michigan University, where he took on the task of turning EMU into a competitive Div. I program. In five seasons at EMU, Boone quadrupled the program’s wins total and set several Eagles attendance records. Boone left EMU following the 2005 season to become the head coach at Tusculum College, a member of NCAA Div. II and the South Atlantic Conference. “The whole reason I ended up at Tusculum in a nutshell was to coach Jimmy [Boone’s oldest son],” Boone said. In 2009, the Pioneers won a school-record 20 games and made their second-ever trip to the NCAA Tournament. Boone still holds the school record for conference wins over a four-year period. After Jimmy graduated from Tusculum, Boone wanted to move into a Division II program where he would have the chance and the resources to lead a program with the capability to compete on a national level. The athletic director at West Virginia Wesleyan College called Boone one day and offered him the opportunity to coach their basketball program, and with it came a lot of promises that those resources would be available. Boone left Tusculum in 2011 to be the head coach at West Virginia Wesleyan. Under Boone’s leadership, the West Virginia Wesleyan Bobcats finished with an overall record of 22-9 during the 2011-2012 season and won the program’s first-ever NCAA Division II Regional Tournament Championship appearance. One day Boone was sitting at home when he received a call from Amy Champion, the athletics director at the University of New Orleans. Boone had interviewed at New Orleans when he was still at Tusculum, and although Champion wanted to hire him as a basketball coach, the university ultimately decided to hire a different coach, but Champion still stayed in touch with the Boones. Champion was a former player for the historic Lady Statesmen basketball program under former head coach Lloyd Clark and wanted to know if Boone was interested in applying for the men’s head coaching job at Delta State. “Well, are you willing to listen to what I have to say about Delta State?” Champion asked. The conversation lasted about 10-15 minutes. She knew Delta State was exactly what Boone was looking for in his coaching career. After hearing about the positive attributes of Delta State, Boone was sold. After speaking with Champion, Boone phoned the athletics director at Delta State. That conversation led to an interview on campus, and the interview led to the job offer. Boone was named head coach of the Statesmen basketball program in 2012. Prior to Boone’s arrival, the Statesmen won only five games in the 2011-2012 season, but during his first season as head coach at Delta State, Boone turned the Statesmen basketball program around. He instituted his philosophy of hard work, discipline and teamwork. Since the Boone era began, the Statesmen have climbed to the top of GSC competition. 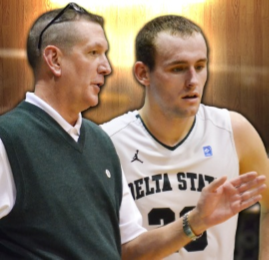 Most notably, Boone led the Statesmen to one of the best seasons in program history in 2013-2014, as Delta State went 26-7 overall, captured the Gulf South Conference regular season title and made a run to the NCAA Sweet 16. He was named GSC Coach of the Year in 2014—the seventh time in his career he has captured such an honor. Last season, the Statesmen struggled with injuries and setbacks, but Boone overcame all obstacles and led the Statesmen to the postseason for a second-straight year. He has produced the conference’s last two Freshman of the Year winners in Devin Schmidt and PJ Davis and GSC Player of the Year in 2013-14, Willie Readus, who is playing professionally overseas. This season under Boone’s leadership, the Statesmen are top contenders in the league. Delta State leads the league in scoring defense (68.1 ppg), field goal percentage defense (41.0 percent), free throw percentage (75.0 percent), offensive rebounding (39.8 rpg) and defensive rebounding (32.5 rpg). Boone earned his 400th career win at the Division II level on Jan. 2 with a 97-74 win over North Alabama at home. Boone is only five wins away from the 500-career win mark for his overall career. During Boone’s career, his teams have recorded 17 or more wins on 16 occasions, including six conference championships, four tournament titles and seven postseason appearances. His 94-24 league record in the PSAC is still the best of any coach in that conference’s history. He was named PSAC Coach of the Year on three occasions (1988, 1992, 1996) and NCAA Region Coach of the Year twice (1992, 1996). However, Boone says his greatest accomplishment is to see the success his former players have in whatever path of life they choose. “To be able to see people who have gone through your program and are having success after their tenure as a player—that’s the most important thing that we do – helping shape the lives of the young people that participate on our teams to be successful thereafter,” Boone said.